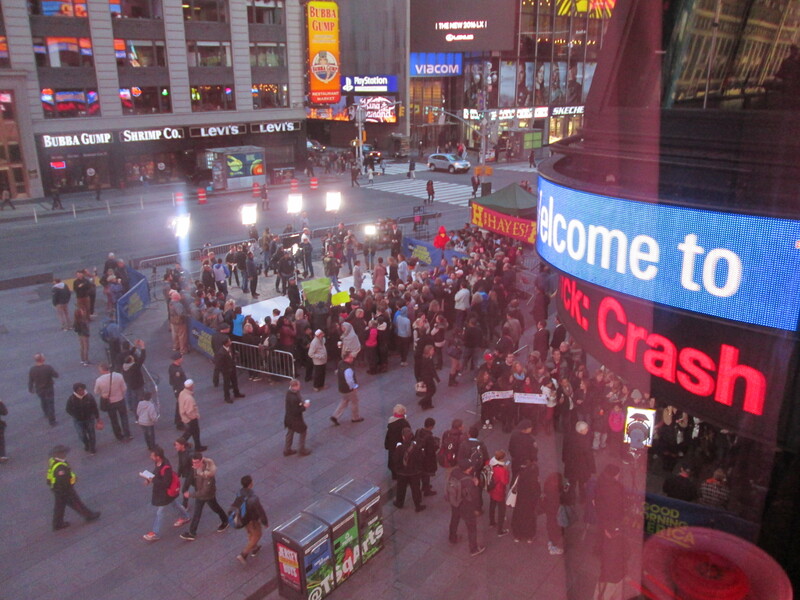 The Good Morning America Times Square lights during our segment. Photo screenshot from GMA airing. We thought we had our 15 minutes of fame when we were on Good Morning America in 2011. But I am now on their email list, when they’re looking for families to feature for other segments. 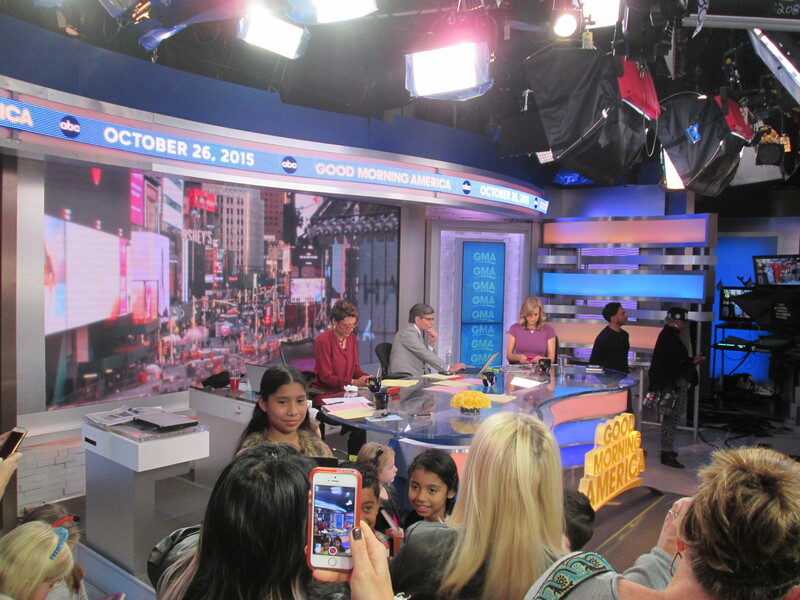 So when I got an email from a producer last week saying they needed 10 kids to appear on Good Morning America with Jeff Kinney about his 10th book Old School, it took me about one minute to respond. My son was at the tail end of their cut-off age, so I signed him up. 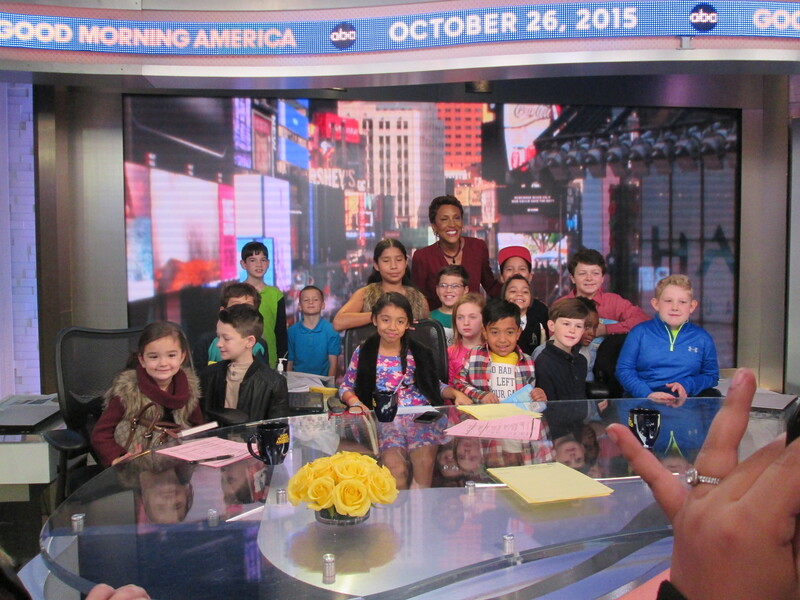 He’d only miss 2.5 hours of school (granted, that meant we had to wake up at 5:15 to get into the city – and no they didn’t send a car for us, but that would have been nice), but it was a live studio segment. I put out a call for others on Facebook, and one friend made it in before they filled the quota two hours later. Turns out people came in from further afield – like Massachusetts and Maine. I’m glad I didn’t have to travel that far for the four minute segment! 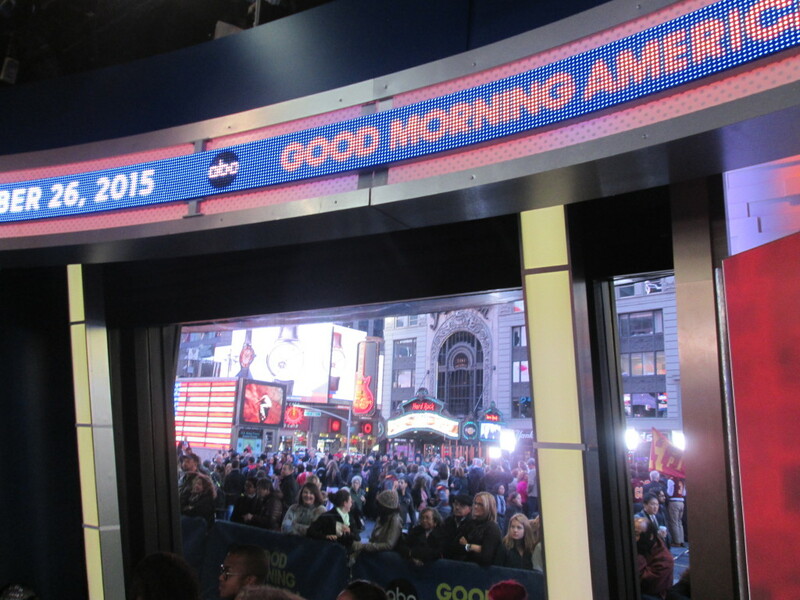 We were told to appear at the studio entrance at 7:30 a.m., not knowing what time we’d actually go on air. Inside we were supposed to go to the green room, where guests on the show wait until it’s “go time.” But the green room was already full, so we hung out on the ESPN set of Around the Horn, a show I hadn’t heard of (I’m not a big sports fan), which oddly had a skeleton on a gurney very close by. Finally they brought us to the green room, which I thought would be a big, fancy room with gourmet food. They promised us breakfast and we were hungry! Turns out this green room seemed to be for regular folks and was nothing fancy. 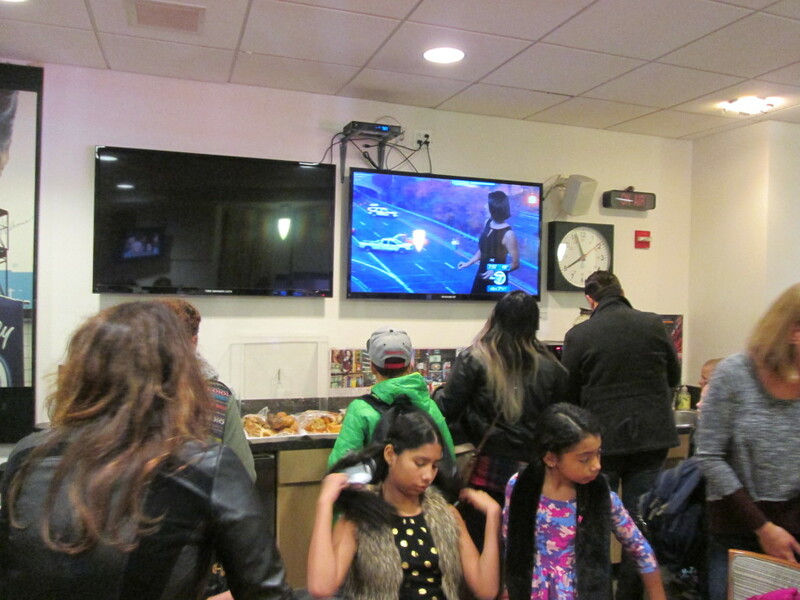 Not sure what the VIP green room looks like, as that morning Demi Lovato, Nick Jonas, Ne-Yo, David Foster and Jeff Kinney were there too, and they were not in our green room. Ours looked like a school teachers’ lounge, with some trays of plastic-wrapped bagels and muffins (and individual serving plastic containers of cream cheese and butter), and a fruit salad (yummy, yummy). There were some coffee pots plus powdered creamer. 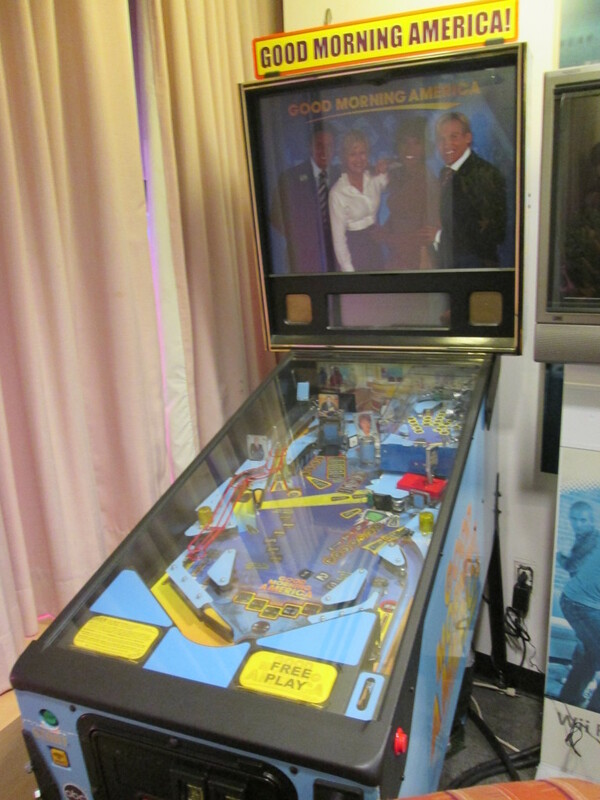 My son was excited to see a Good Morning America pinball machine in the corner (we just went to the Silverball Museum in Asbury Park this weekend). This machine was not plugged in, though. Probably a good thing because with 20 kids and 20 parents, plus other random people including another non-VIP guest (the expert taking about how to keep tabs on your nanny), it was very crowded. 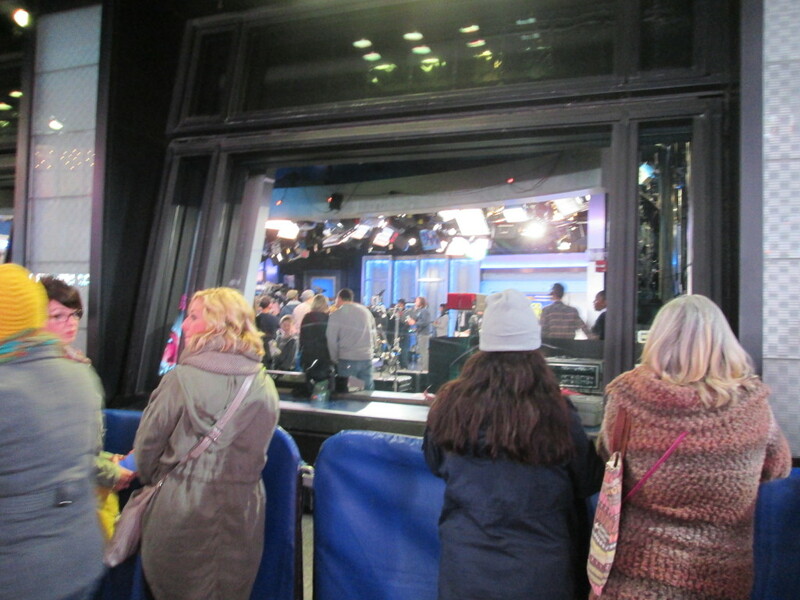 We could see Times Square, though, and watched the anchors go outside to film an outdoor live segment. The producer came over to one kid and said “I heard you have a question for Jeff Kinney!” Of course he did – all the kids had questions. Not sure how this kid was chosen, but one or two others were also asked to pick items out of the prop box on air for Kinney to draw. While the kids were promised copies of the new book when we signed on, they ended up taking our name/addresses to send them to us. So no preview for us and no book review from my son before the book comes out on November 3rd. 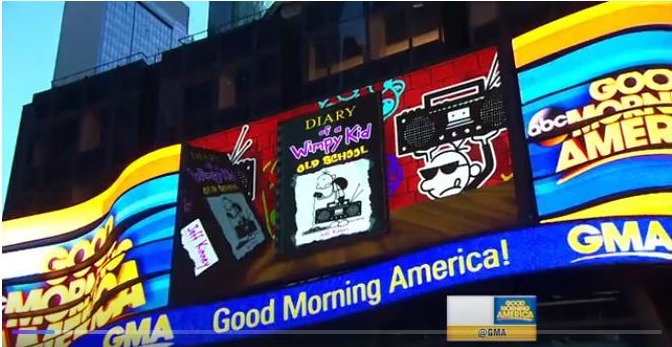 But the producer came in to say that Kinney had books to sign for the kids, and they brought in a box of other Diary of a Wimpy Kid hardcover books, and he very nicely talked to the awkward, silent kids and signed a book for each. My son chose the one book we didn’t have at home (also because he knew I hadn’t read that one yet – my son is sweet that way!). Kinney would ask the kids “what color book do you want?” which I thought was funny. It’s safe to say my son was the oldest one there, a head taller that most, and perhaps the only one actually in middle school (though the book skews toward elementary school readers anyway). Kinney asked Zack how old he was, since Kinney thought he may just be a super tall 9 or 10 year old. Nope, my son is 12, the same age as Kinney’s oldest. While it was really nice of them to give the kids all books, they also wanted the kids to hold their books during the segment, so I think there was an ulterior motive. We were told that at 8:25 to head down to the studio for their 8:38 air time, and we had to be really quiet since it was live. The elevator was quite large, and we later saw why. Just before we went into the studio, they carried out one of the sets, which had chairs and flooring, and it had to go in the elevator. The kids were brought over to the story-time type area, with Kinney and Lara Spencer on chairs. The boy who was to ask the question had been miked, and the kids who had roles were given their cues and told to stand up when it was their turn. The parents were shoved in the back behind the cameras (we were glad to be allowed in, as we were told we might not be allowed in because of space restrictions). They cordoned us off with red velvet ropes, so we couldn’t move forward. 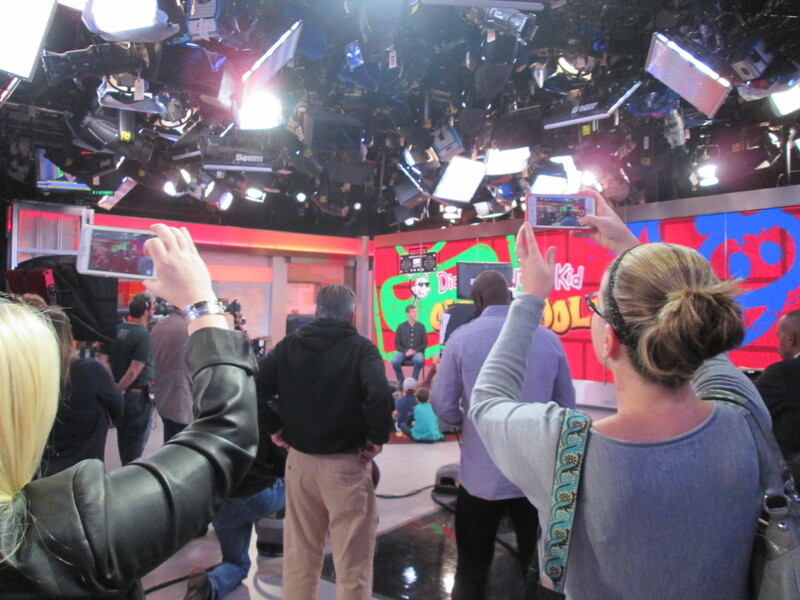 During the segment, the parents all had their phones out recording, and you could see the spectators outside watching too. Interestingly, it was hard to hear the interview. Though everyone was miked, the microphones didn’t amplify the sound, just recorded it. So I heard very little of the interview, and saw even less (the damn cameras were in the way). I had to find out via text from my husband that my kid did appear on camera, though GMA uploaded the video within hours. 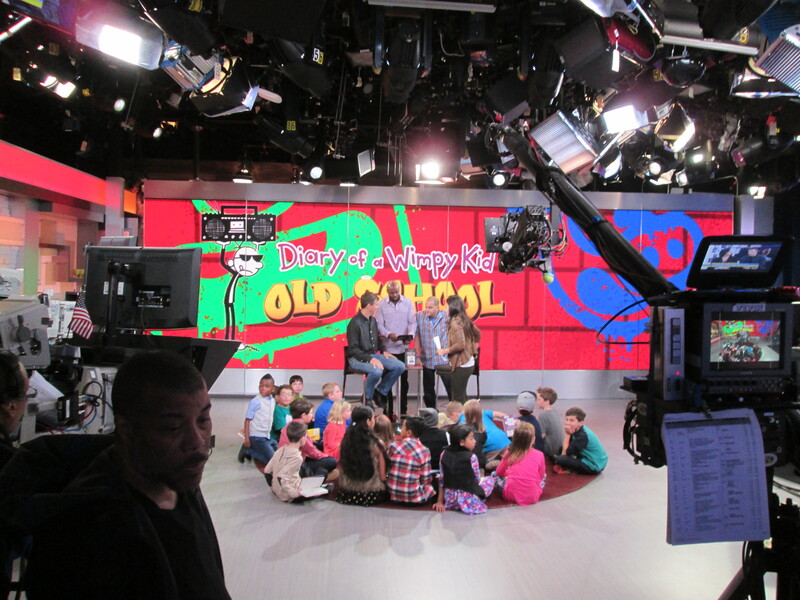 Here’s the GMA Jeff Kinney video, followed by what I could see and hear from the back of the studio. My son said he’d never watch TV the same way again, because in the middle of the segment, one of the camera guys was whispering “get down!” to the kid who grabbed a prop and continued to stand. You can’t hear it on TV, but it was pretty funny. 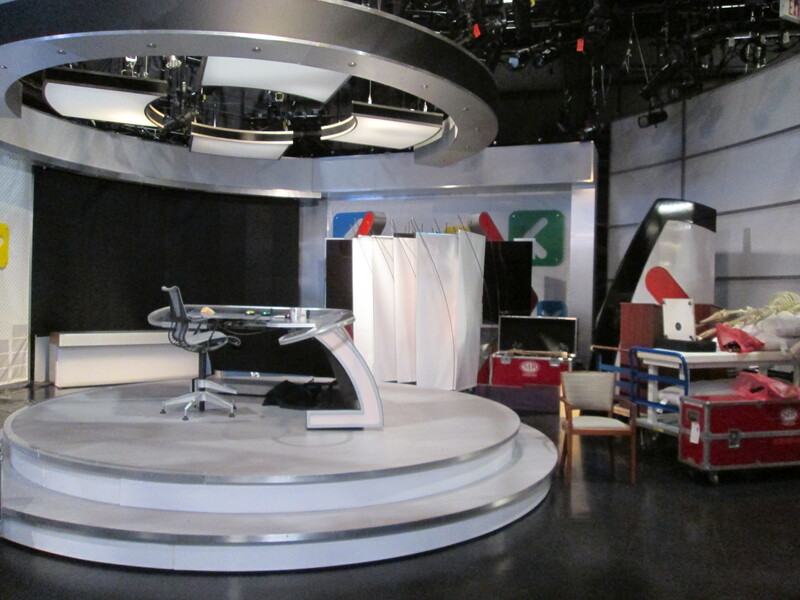 When the four minute segment was done, the area was quickly cleared, and the kids were brought behind the ropes with us, while the studio was set up for another segment. 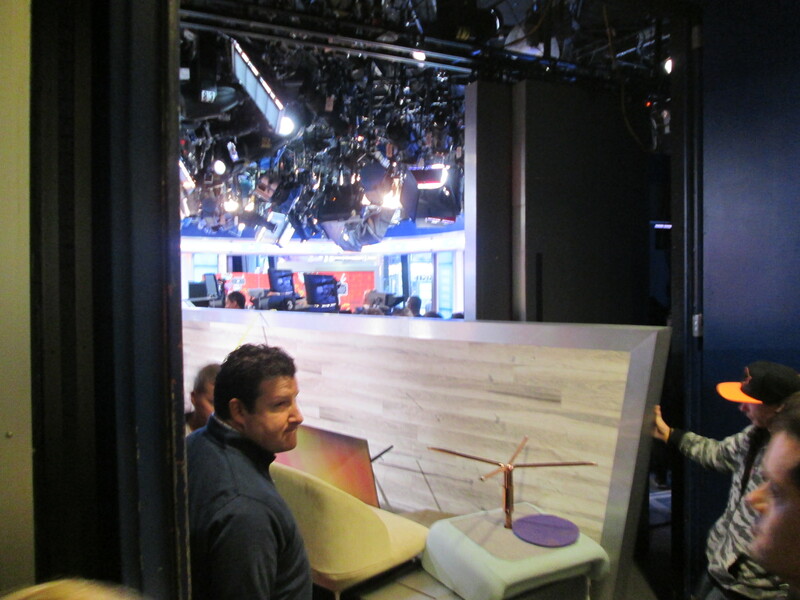 On the opposite side of the interview set, we saw Robin Roberts and George Stephanopoulos reviewing their notes, then Lara Spencer joined them at the table, checking her phone. 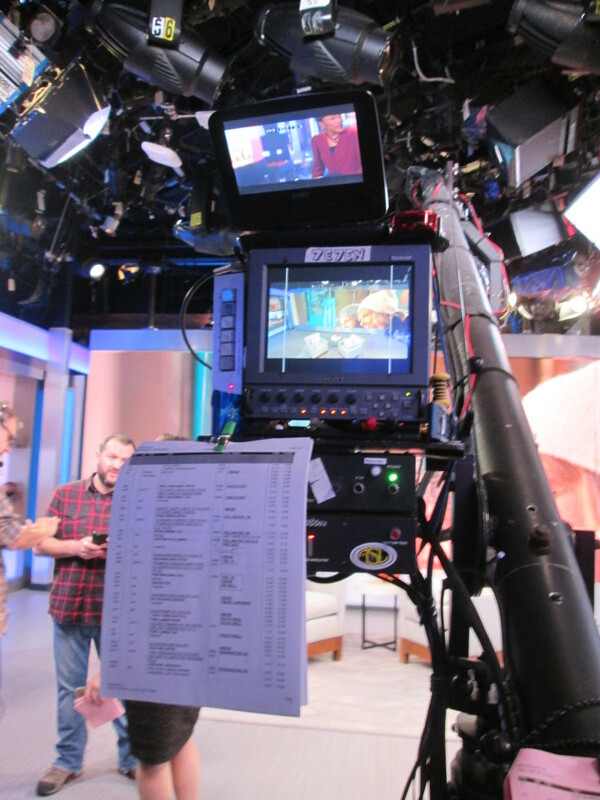 The cameras were moving around, and we could see the teleprompter below the lens, and a TV screen above it. When Stephanopoulos introduced the next recorded segment, again we could barely hear him. By now, the other studio area was set up and David Foster was banging around on the piano. They did a sound check with Ne-Yo singing, and his backup dancers hid behind the wall we were against. Ne-Yo waved to the spectators outside and fist-bumped one of the kids in our group. He performed Friend Like Me from Aladdin for the new We Love Disney album. 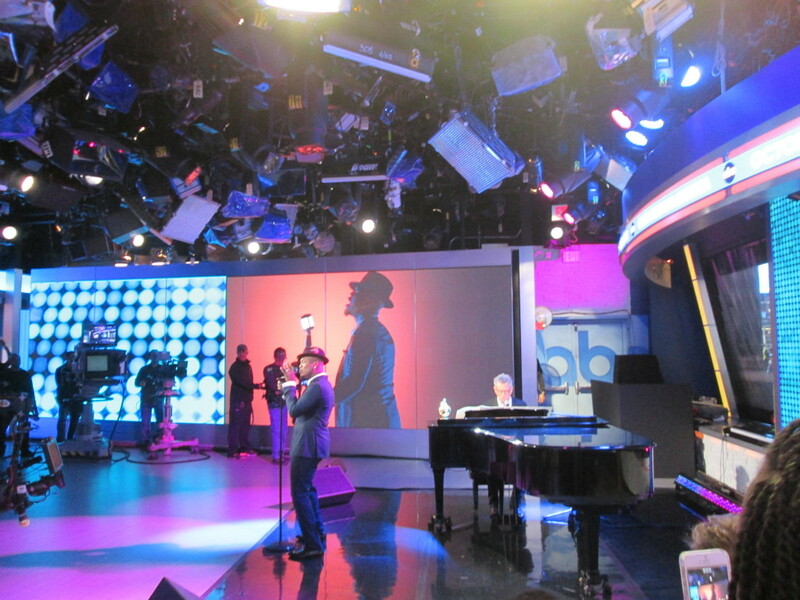 You can see the Robin Roberts introduction of the Friend Like Me performance here from Good Morning America, and see what we could see and hear here. Don’t bother adjusting the volume – you really can’t hear much on my recording, because the microphone didn’t carry – it only recorded. I was standing all of 15-20 feet from Robin as she introduced him and couldn’t hear anything she said. Fortunately you could hear Ne-Yo and David Foster. See a short clip from GMA here, and my version here. 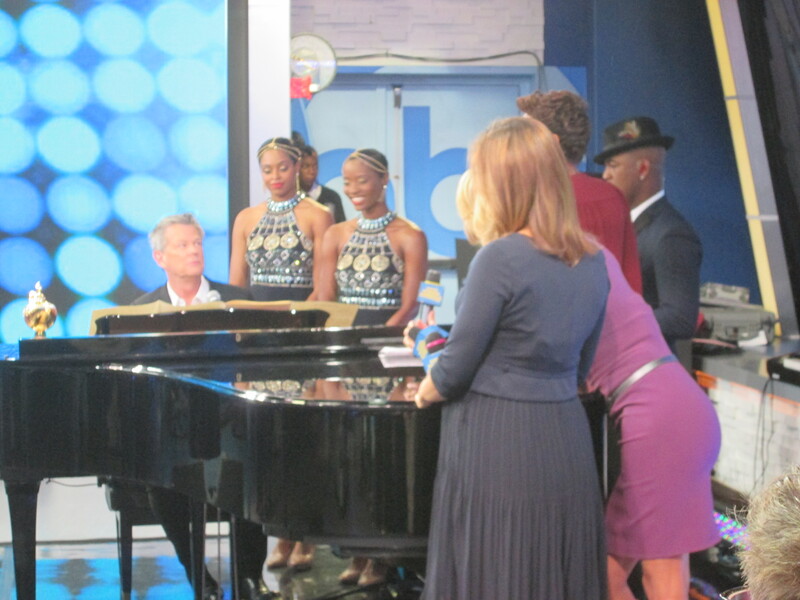 After that, the anchors signed off at the piano, and took a group picture with Ne-Yo, his singers and David Foster. A couple of the kids went to Robin’s seat to get photos on that set and with Robin posing with them. Turns out their mom works for the show. Of course now the rest of the kids wanted to go up there and parents wanted pictures too. Robin was kind enough to offer a group photo with all the kids, which she did not have to do – she was gracious about it. In all, it was fun experience. My son really liked looking up at the ceiling and seeing all the lights. I enjoyed watching the behind-the-scenes actions while they got ready for each segment. The producers all had packets with the show information for the day – there are a lot of logistics, and a lot of waiting around. From there we headed back out to the street. There was a big crowd waiting at the stage door entrance (we exited one door over) and for a moment we laughed that they were all waiting for us. Of course they didn’t make a sound when we came out, so we knew that wasn’t reality, but we could think it just the same. Thank you to GMA for including us! Steve – they did not, but they were great on Facebook!